HP PurchasEdge - Join Now! 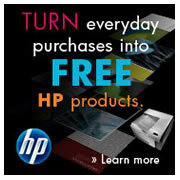 Now is the time to join HP PurchasEdge for additional savings on genuine HP Brand toner cartridges. PurchasEdge is designed for businesses that buy more than $500 of HP consumables (inkjet and toner cartridges) in a year. With PurchasEdge, you get 1 point for every $4 USD of HP inkjet and toner cartridges you buy. Your points can be used to buy HP hardware such as HP LaserJet Printers. Click here to for more information. Click here to sign up for PurchasEdge.